Hi, I'd like to show you this page I found on Furniture Fair - North Carolina's website. Customize the look of this dresser with your choice of color panels. Situated behind the sophisticated egg-and-dart lattice accents, the color panels add fun to the contemporary style of this dresser. The six drawers with smooth operating drawers with side roller glides hold clothing and other belongings with ease. The top of the dresser offers additional room to accessorize and store items in a youth bedroom. The Zayley 6-Drawer Dresser with Customizable Color Panels by Signature Design by Ashley at Furniture Fair - North Carolina in the Jacksonville, Greenville, Goldsboro, New Bern, Rocky Mount, Wilmington NC area. Product availability may vary. Contact us for the most current availability on this product. Case Detail Bracket Feet. Top Molding Trim. Drawer Suspension Side roller glides for smooth operating drawers. Warranty Products shall be free from defects in material and workmanship for a period of 1 year to the original purchaser, under normal household use and service, following the date of purchase to the original purchaser. The Zayley collection offers contemporary style along with great storage and personalization options for a girl's bedroom. The bright replicated white paint finish of the Zayley youth bedroom collection complements decorative Egg and Dart shape lattice accents. 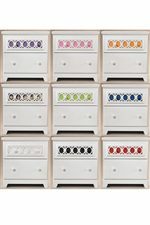 Nine interchangeable color panel options for the color blocks behind the lattice work on top drawers and beds let your daughter add her own personal flair to her bedroom décor. She's sure to love it! The bedside bookcase bed in twin or full sizes is a modernized day bed with lots of storage capacity in the headboard and footboard. The Zayley collection is a great option if you are looking for Contemporary furniture in the Jacksonville, Greenville, Goldsboro, New Bern, Rocky Mount, Wilmington NC area. Browse other items in the Zayley collection from Furniture Fair - North Carolina in the Jacksonville, Greenville, Goldsboro, New Bern, Rocky Mount, Wilmington NC area. Goldsboro, NC - East Ash St.
Goldsboro, NC - Landmark Dr.
Jacksonville, NC - Bell Fork Rd. Jacksonville, NC - Lejeune Blvd. Furniture Fair - North Carolina features a great selection of living room, bedroom, dining room, home office, entertainment, accent, furniture, and mattresses, in the Jacksonville, Goldsboro, New Bern, Kinston, Wilmington, Greenville, and Morehead City, North Carolina areas. With trained salespeople who can help you with your home design and decorating, Furniture Fair is your premier Jacksonville, North Carolina Furniture Store. View recent additions to our online furniture gallery. Furniture Fair - North Carolina offers great quality furniture, at a low price to the Jacksonville, Greenville, Goldsboro, New Bern, Rocky Mount, Morehead City, Kinston, Wilmington, Eastern North Carolina area. Whether you're looking for bedroom furniture, dining room furniture, kid's room furniture, living room furniture, or other furniture, Furniture Fair in Jacksonville, NC will help you discover the perfect furniture for your home. Online Pricing - While we strive for accuracy, manufacturer online pricing restrictions and ever changing selection makes it unfeasible maintain accuracy on all prices. In the event of a price discrepancy between our website and our showroom, the showroom pricing will be deemed accurate. The prices listed are for the configurations as shown. Changes to finish, color, grade, fabric or leather may lead to price changes. Please contact us and we will be happy to assist you with product pricing and information.